A drug addict faces more than a year in jail if he goes back on a promise to turn his life around. 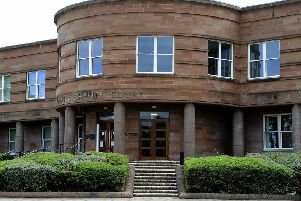 Barry Newman (32), a prisoner, faced double trouble when he appeared from custody at Falkirk Sheriff Court last week. He had been jailed for 28 months in 2014 on a heroin dealing charge, then after being freed having served only half of his sentence he was arrested again on another-drug related charge. Last year, instead of more jail Newman was given a drug treatment and testing order, but Sheriff Craig Caldwell heard he had breached that order. He had also breached the supervised release order imposed in 2014 by his further offending. The court heard Newman was arrested in Glenfuir Road, Camelon, in June 2014 and found to have heroin worth more than £2,000. He claimed he was only a courier and hadn’t been paid because by being caught he had botched the job. Newman was being supervised for a year after his early release from that sentence, but he admitted being concerned in the supply of heroin again in Falkirk in September last year. Sheriff Caldwell said, given the background, it was “difficult to see what can be done apart from sending him back to prison to serve the rest of the 28-month sentence”. However, defence agent Gordon Addison urged the sheriff not to take that course of action. Mr Addison said: “When he is busy and working my client does not offend or take drugs. He is in a relationship and has managed to hold a tenancy. While in custody awaiting this case he hasn’t been taking drugs. The solicitor said Newman has no outstanding cases and suggested a community payback order could be imposed. Sheriff Caldwell agreed to defer sentence until November 10 to see if Newman can secure the certificate and a job.